Two local gardeners, Cally Ingram Slager and Cadri Curry, from Monroe and Snohomish, respectively, use manure from Qualco Energy in the Tualco area. Qualco Energy is an electricity- producing facility that digests manure and other organic feedstocks to capture methane, powering a 450KW generator to generate electricity that feeds the local power grid. The separated solids are composted and provide a great finished product that is light and odorless. Qualco does charge for their product, due to the costs of running the digester. Monroe gardener Cally Ingram Slager uses composted manure from Qualco Energy in her raised vegetable beds, in a small area with pumpkins, in the flower gardens around her house, and under her blueberry bushes. 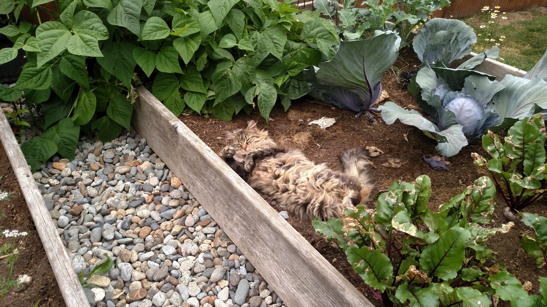 Cally’s kitty, Moaning Myrtle, loves the garden too! Cadri’s new gardens are not quite finished, but will soon be used for growing a vegetable garden. 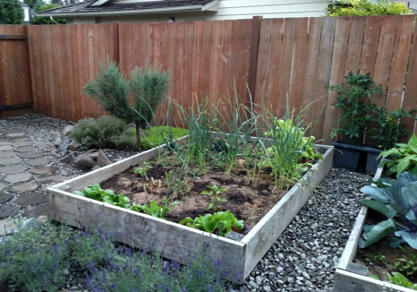 The raised beds are filled with the 2:1 mix of compost and garden mix. Did you know that the Snohomish Conservation District has a ‘Manure Share’ List? Call 425-335-5634 and ask for one of our farm planners who can email the list to you and offer suggestions on home use of manure. If you have excess manure to share, or want to be on the list receive manure, please let us know and we will update our manure share list. The District can also provide guidelines and bags for taking your own soil tests and interpreting the results.